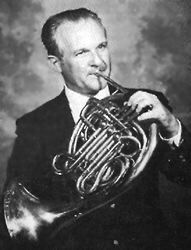 Mason Jones is best known for his long tenure with the Philadelphia Orchestra, but he also published music for horn players, recorded chamber and solo literature, and taught many students at Curtis Institute and at home, passing on the traditions of Anton Horner, Marcel Tabuteau, and Fritz Reiner. Jones was born in 1919 in Hamilton NY, where his father was a professor of Romance Languages at Colgate University. His mother was a pianist, and Jones first played the piano, then the trumpet. The local conductor switched him to horn (which he liked much better) and suggested he audition at the Curtis Institute of Music in Philadelphia. While in high school, Jones played in the Utica NY Symphony on a brass Kruspe borrowed from Colgate University. From 1936 to 1938 Jones was a student of Anton Horner at Curtis. He was invited to audition for the Philadelphia Orchestra in 1938 when three of its horn players left, and he was hired as third horn. He became principal horn the following season, playing under both Stokowski and Ormandy. His first recording was the Mozart Sinfonia Concertante with Stokowski. During WWII Jones served as principal horn of the Marine Band in Washington DC. In 1946 he returned to the Philadelphia Orchestra and remained principal horn until his retirement in 1978. He also joined the Curtis faculty in 1946, retiring in 1995. After he retired from playing, he continued as Personnel Manager of the orchestra (1963-86) and conducted school concerts (1972-82). In an interview in the February 1996 issue of The Horn Call, Jones commented, "It [the Philadelphia Orchestra] was my only position and when I was young, it was like heaven. I had no desire to go any other place and was perfectly happy in Philadelphia all the way through." Playing the Shostakovich Cello concerto with Rostropovitch, with Shostakovich present for rehearsals, concerts, and recording, was a highlight. Jones was a co-founder of the Philadelphia Woodwind Quintet (1950) and the Philadelphia Brass Ensemble (1957). His conducting included the Episcopal Academy Orchestra (1958-60) and the Philadelphia Chamber Orchestra (1961-64). Colgate University bestowed an Honorary Doctor of Music degree on Jones in 1970. He was elected an IHS Honorary Member in 1979 and served as President in 1986-87. His recordings of the standard horn repertoire include the concertos of Mozart and Strauss, and the Hindemith Sonata with pianist Glenn Gould. Many recordings of standard solo repertoire were part of the Philadelphia Orchestra series "First Chair" and "First Chair Encores."